In the midst of the crowd, there was a stir, and a line of people started to form: Jane Avril was dancing, twirling, gracefully, lightly, a little madly; pale, skinny, thoroughbred, she twirled and reversed, weightless, fed on flowers; Lautrec was shouting out his admiration. 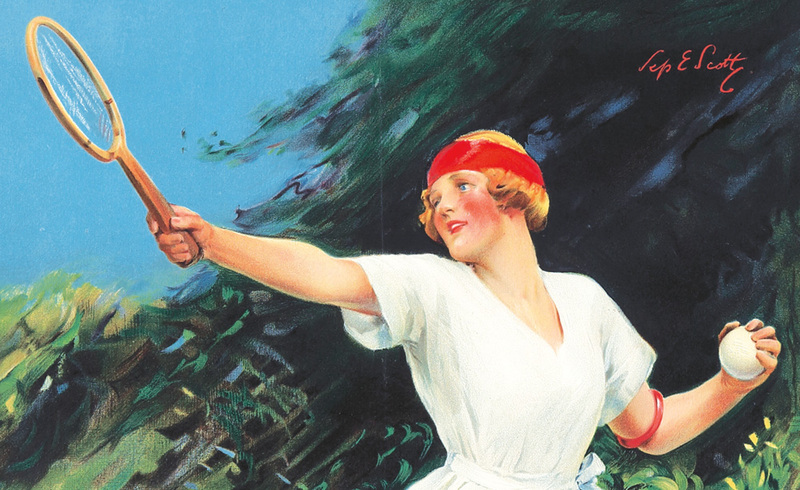 “Inexpressible strangeness,” wrote the newspapers struggling to define the phenomenon of Jane Avril. “Like an orchid in a frenzy,” a critic noted, in contradiction to the above. The girl who would become Jane Avril ran away from a life of poverty and abuse at the age of 13; a little later, she found herself at the Salpêtrière Hospital, a teaching hospital of the Sorbonne and an asylum for the mentally ill. She’d been diagnosed with St Vitus’ Dance. That was the popular term for Sydenham’s chorea, a neurological disorder first reported in 1802. The disorder is typically a childhood or adolescent affliction, brought on by acute rheumatic fever. It’s a little like Tourette’s Syndrome, but without the swearing: lots of irregular tics and weird movements — but in the case of Sydenham’s, with a lot more rhythmic swaying, a drunkenness, silly movements that yet have a kind of grace to them. You can see what I mean in this video, and also in this one. At Salpêtrière, Jane Avril was under the care of Jean-Martin Charcot, now known as “the father of neurology.” But Charcot, apparently, didn’t cure her. At one of the hospital’s fancy-dress balls, Avril recognized the similarities between her illness and the rhythmic motions of dance. Dancing both exhilarated her, and calmed her. Afterward, she was taken in by a brothel. By the age of 20, she was on the chorus line at the Moulin-Rouge. Symptoms of Sydenham’s chorea usually resolve themselves after a few months. Was Avril always neurologically impaired? Or did she make a decision to embrace the kinetic idea of the medical condition? To make St Vitus’ Dance her own? 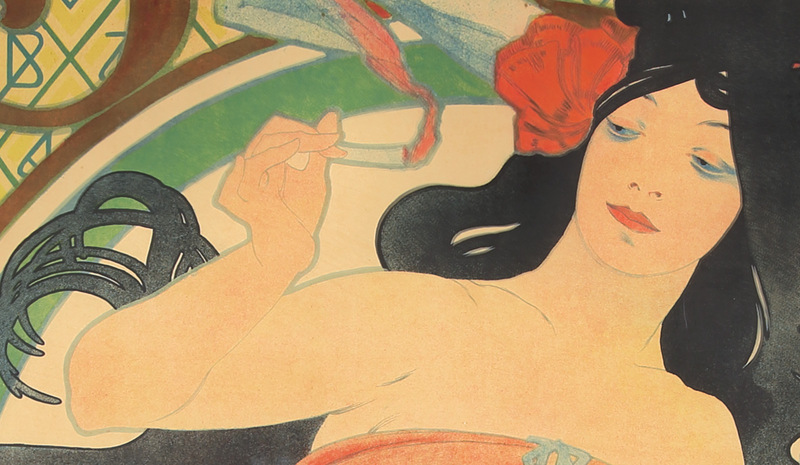 The very essence of Jane Avril seems one and the same with the essence of the Montmartre demi-monde: the sexualization of infirmity, deformity, perversity – when it’s on display. “Universally considered his most brilliant and successful design” (Wagner, p. 22). The Wine Spectator introduces Toulouse-Lautrec’s world-famous lithograph this way: “Jane Avril on stage doing her specialty, which, according to contemporaries, was essentially a cancan that she made exotic by making a pretense of prudery – the ‘depraved virgin’ image aimed at arousing the prurience in the predominantly male audience. 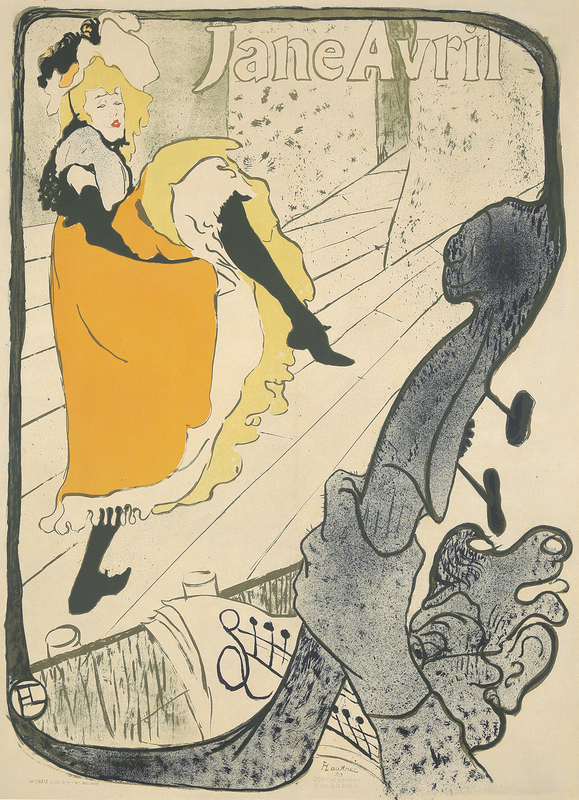 The sexual innuendo was captured by the artist by contrasting the dancer’s slender legs with the robust, phallic neck of the bass viol in the foreground – a masterly stroke that not only heightens our perception but also creates an unusual perspective: we see the performer as an orchestra member would, and this allows Toulouse-Lautrec to show, as if inadvertently, how tired and somewhat downcast she looks close-up, not at all in keeping with the gaiety of the dance that is perceived by the audience. It is clear, as Maindron has pointed out, that she is dancing entirely for the viewer’s pleasure, not hers, which makes it a highly poignant image. Seemingly without trying, Toulouse-Lautrec not only creates a great poster but makes a personal statement: Only a person who really cares about his subject as a human being would portray her with such startling candor” (Wine Spectator, 41). 376. Troupe de Mlle Eglantine. 1896. 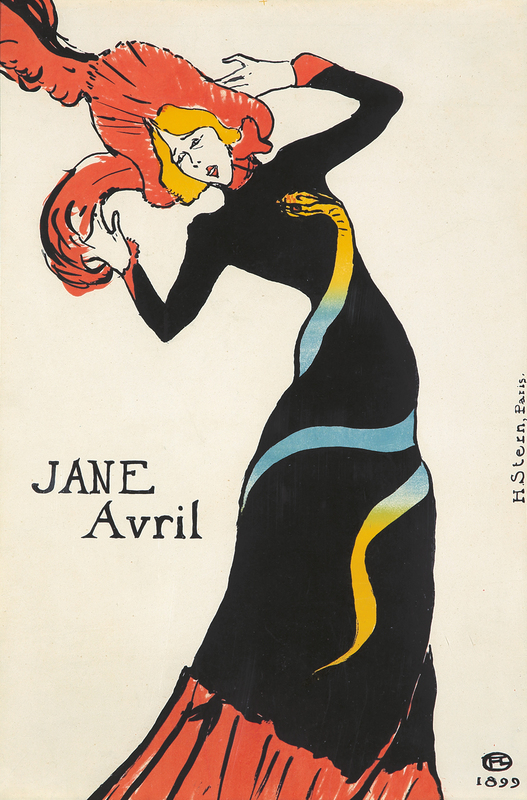 One of the landmark works of the Art Nouveau period, this 1899 lithograph of Jane Avril is the second-to-last poster Toulouse-Lautrec would ever design. It was a fitting, poetic coda for the artist. Avril and Lautrec’s friendship blossomed with their careers. 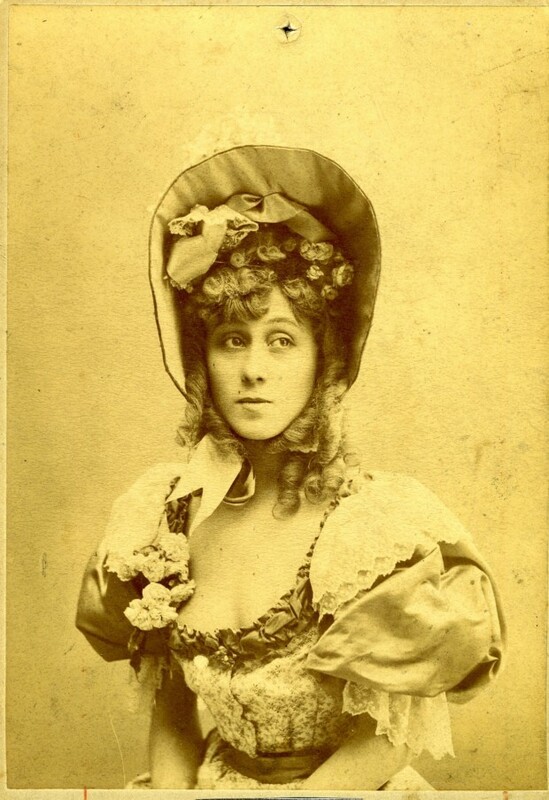 Beautiful but shy, elegant but melancholic, Avril was the opposite of La Goulue, her boisterous rival at the Moulin-Rouge. But with several superb early posters, Lautrec elevated her fame such that Avril replaced La Goulue as the star of the show in 1895. In the early months of 1899, Toulouse-Lautrec had a nervous breakdown and was confined to a sanatorium. Out of friendship, Avril commissioned this work from him. 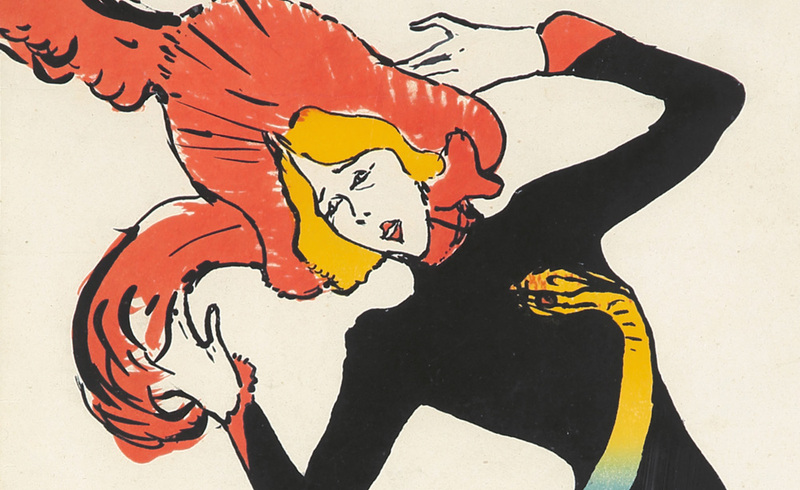 Working from a photograph as an aide-mémoire, Lautrec “distilled the very essence of Avril, where the serpentine nature of her dancing is emphasized by her swaying body. . .and the wrap-around snake motif. . .” (National Gallery of Australia). 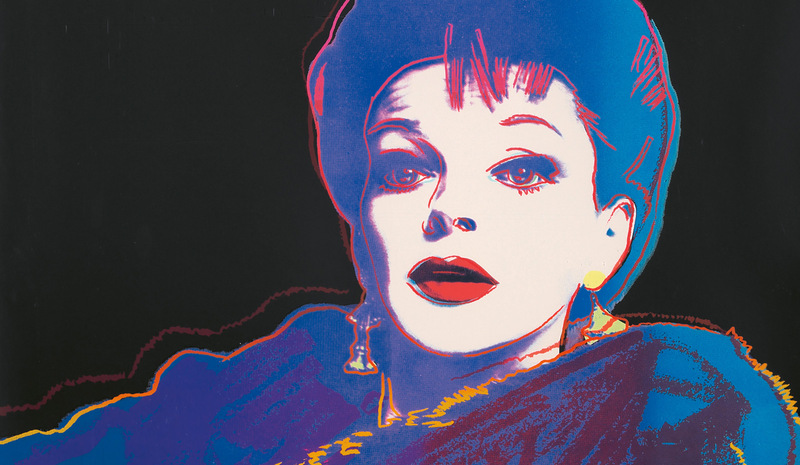 “She liked the poster very much, but her impresario refused it, and it was never shown” (Abdy, pp. 80-81). 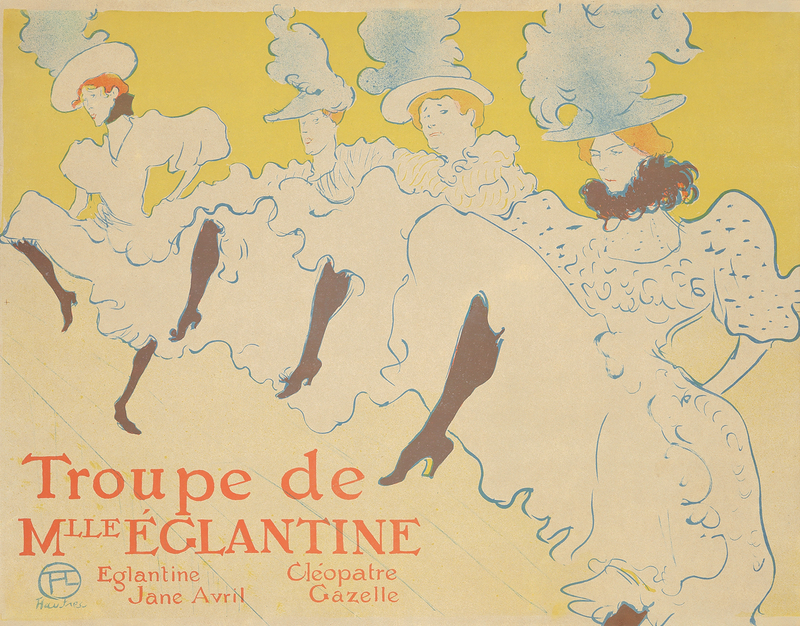 For this poster, Lautrec used an innovative process which required only three printings for the four colors used (Adriani, p. 411). The rouge of petals in a shower. Into the circle of its rounds. Her morbid, vague, ambiguous grace. Alike the shadows of a dream. The shadows and the dancers turn. Back to a shadow in the night.